High Technology is experiencing unprecedented change fueled by the growth of cloud, social, and mobile technologies. While these technology innovations present opportunity for emerging technology companies, innovation continues to place immense pressure on established product companies to reinvent themselves. Driven by competitive forces, growth ambitions, and the need to maintain profitability levels, this is forcing technology leaders to revisit strategy, test new approaches and enhance capabilities in all areas of their business. This multi-faceted challenge requires investment to develop the capabilities necessary to successfully compete and grow, while also demanding profitabile execution today, in order to afford investment spend for tomorrow. Maturing your business processes and services are the key to addressing these challenges. Unified platform Cloud solutions provide the streamlined execution and analytics necessary to succeed in today’s volatile, rapid paced business environment. While we bring decades of experience with Oracle solutions, our greatest value as your partner is in ensuring your business attains its goals by utilizing the power of our Cloud solutions. 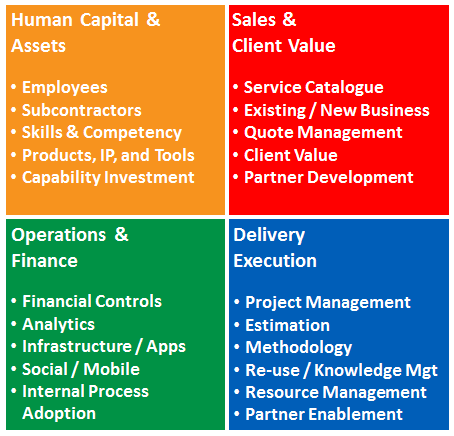 Our business value driven approach uses our Service Evolution Framework to understand and identify where the most significant gains can be made within your business. Whether you need to select and implement new technology to run your business or modify existing technology and process, our approach starts with your business priorities and then addresses the underlying process, technology, and organizational capabilities required to meet your business goals. By working from desired results backwards to current state, we work with your organization to collaboratively define your business vision and the sequence of incremental changes that will help you achieve your goals. Most of the common process and analytics challenges your high technology business faces are already addressed through the base configuration of our Services Resource Planning for Professional Services Organizations. Through alignment workshops, your stakeholders review “a day in the life” scenario of this best practice solution to understand how they would operate your business using the software. The design principle is to look at how your organization can leverage the built in best practices rather than re-design the solution. Any solution modifications that are done focus on tailoring needed to address your reporting and any extenuating requirements. The result of this approach is that design, configuration, and test cycles are significantly reduced. As part of training and adoption plan, focus is placed on process execution, application use, and the priority Key Performance Indicators (KPI’s) that will drive rapid return to your business such as project overruns, utilization, and sold bill rates. If a full, unified platform solution is not appropriate for your organization’s application footprint, Project Partners can work with your team to identify the appropriate Oracle Cloud applications and implementation roadmap to address existing gaps and complement existing application infrastructure. Interested to see how your business can financially benefit from better visibility and automated processes? Use Project Partners’ Performance Improvement Calculator. Contact Us to learn how we can help your High Technology organization. Project Partners Services Resource Planning for Professional Services Organizations is a fixed price, rapid implementation solution for Oracle Cloud that provides proven business processes and embedded analytics to Professional Services Organizations (PSOs). This turnkey solution will have you up and live on Oracle Cloud in only a few months. This overview video provides an introduction to the Oracle Cloud including the components necessary to the operations of Professional Services Organizations (PSO's). We will demonstrate how the Services Resource Planning (SRP) solution provides PSO's with an accelerated path to Oracle Cloud, increasing operational maturity and financial results. Use this simple calculator to analyze changes in the most critical levers of your Professional Services business. It is a simple yet powerful tool and it only takes a minute to get started. You will find it easy to make adjustments and get instant visual feedback on what your Services P&L may attain. Business leaders are under extreme pressure to increase their contribution to overall business profitability, revenue growth and customer success. They struggle to deliver greater financial return without the visibility to understand current and future performance, pinpoint opportunities for improvement, and stop repeating mistakes. This article explains how to move forward to gain that vital visibility in order to drive predictable performance. Register and read this TSIA blog article. Studies show that the more mature a project-driven organization's processes, the greater their profitability due to improved efficiency, lower costs, increase in utilization and reductions in project overruns. This white paper explains how Services firms can now attain this improved performance and profitability by implementing a unified set of business management applications that enable more efficient execution and provide timely, reliable business information. Register and read it here. This blog article was originally posted on the Technology Services Industry Association Blog. It highlights the balance between doing more with what you have now, in order to afford strategic investments. The challenge, however, is that the organization needs to improve visibility and core processes so it can predictably forecast revenues, resource utilization, and margins to unlock profit and investment dollars. Read more.